These were some of the photos I took during the month of September. I kept printing them out but not doing much with them. I finally realized they all had a common story so I just put it all together. I went through my papers and just grabbed sheets of whatever appealed to me- lots of crimson, pink, and gold, and sort of collaged them down, painted and taped over them, put the photos on, etc. 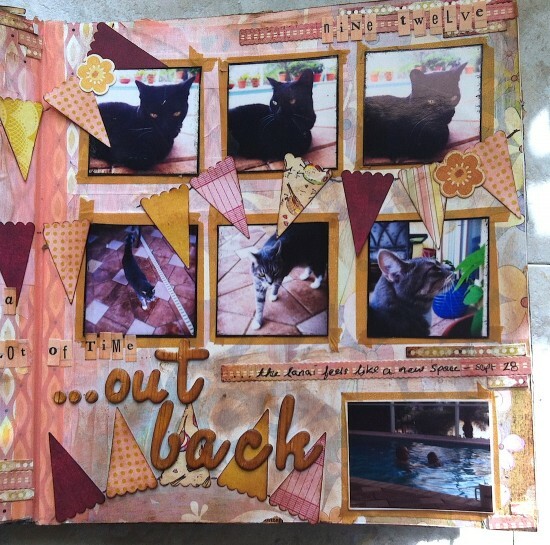 When I was done laying out the photos, I decided to add the banners with scraps of patterned paper and the Jenni Bowlin banner punch, plus some paper flowers I had around, as well. I wanted to capture the afternoon sunlight we’ve had around here- it tends to rain in late afternoon, and then it clears up just at sunset and creates a peachy-golden hue to everything, and that’s when we all tend to go outside for a little bit. Tom and Gracie have been going in the pool a lot during the sunset (when he gets a break from work and she’s home from school and done with her afternoon stuff) and I’ve been out there, as well, hanging out with them and reading. The text reads “I have been waiting for fall all years and now that it’s here all I wish is to be joyfully engaged with this beautiful season.” The wording kind of came together based onw hat I wanted to say and based on the stickers being available, which was kinda cool. 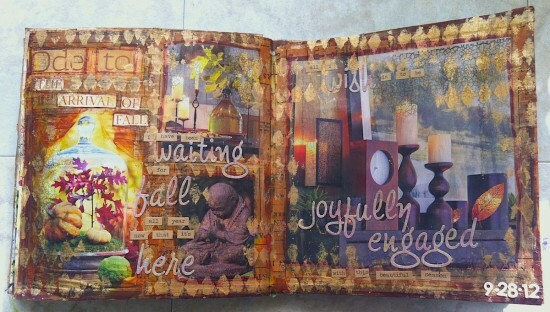 Just a collage with magazine images and words, receipts, stuff from the mail, paint, washi tape, letter stickers, etc. There’s actually, like, 50 layers here- there are magazine images UNDER the ones that ended up on top. I just didn’t like it and kept adding until it came together for me. I used a few Crafter’s Workshop stencils for the harlequin pattern. 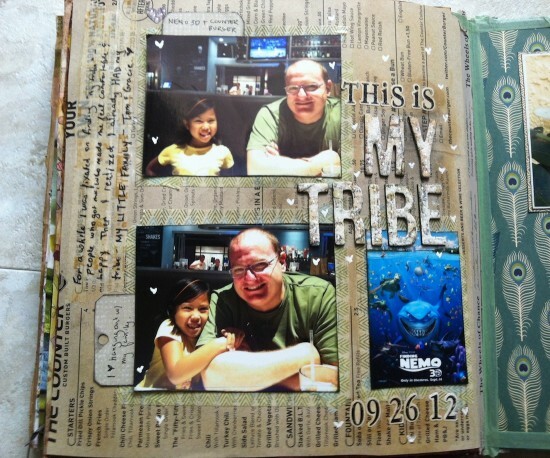 And some of my texture stamps. I have a terrible problem buying stamps and not using them. I really enjoy *having* them, and I have a lovely display shelf that Tom built me for my studio, but it feels good to start just grabbing them and using them. I have this weird thing about stamping- it seems like a drastic and permanent thing before I do it. Like with letter stickers and washi tape, I know I can just remove them if I don’t like it. 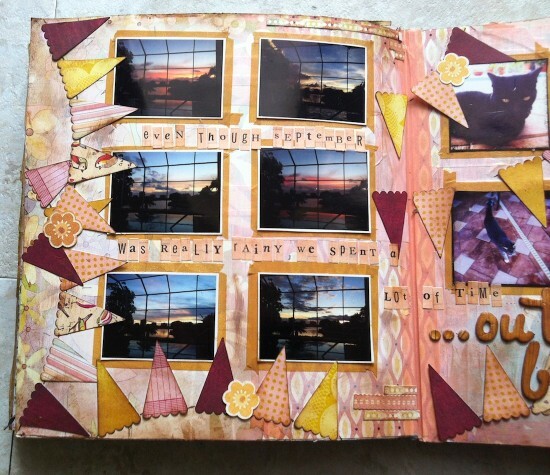 Paint can even be toned down… but once you stamp, that’s pretty much it. But it’s never that drastic. I love the Tim Holtz chatter stickers (the small words) I wish he’d do alphas with that font/size/etc. The background of this page is a menu from the restaurant we went to when I took the photos- we went to go see Nemo in 3-d and then went to dinner on a Wednesday afternoon. 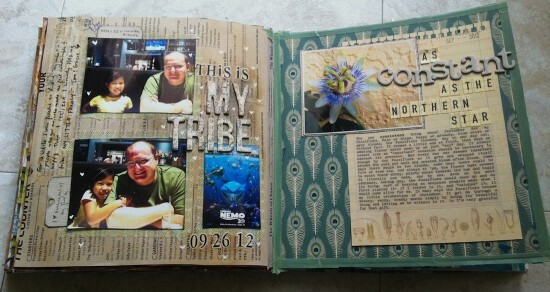 The journaling is about hanging out with my family and how for a while I went through this period where I *really* wanted to find a “tribe”, local friends that I could spend time with and that knew me and that i was super comfortable with, and after a while of looking around, I realized I already HAD that- my family. They are up for anything and we all love hanging out together. 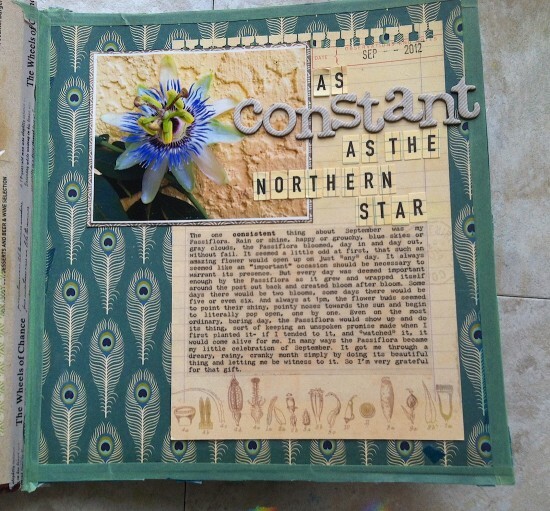 I know photos of the passiflora have been all over my journal pages lately, but I have to admit, it’s sort of one of those small details from September that had a huge impact on me. The journaling is about how no matter what was going on- rain or shine, happy day or hectic day, weekday or weekend, that plant would throw out a bloom (usually multiples) every.single.day. in the month of September. And the blooms open early in the afternoon (it’s actually quite a show when they do open- sort of like popcorn popping, in a way) when I was swimming, so it was kind of my daily “pick me up”, being present for that. Anyway, so there’s all that. Thank you, as always, for looking! Wow- I don’t know where to start- so many beautiful pages here!!! One thing for certain is that your gratitude for your life and family exude from your art. 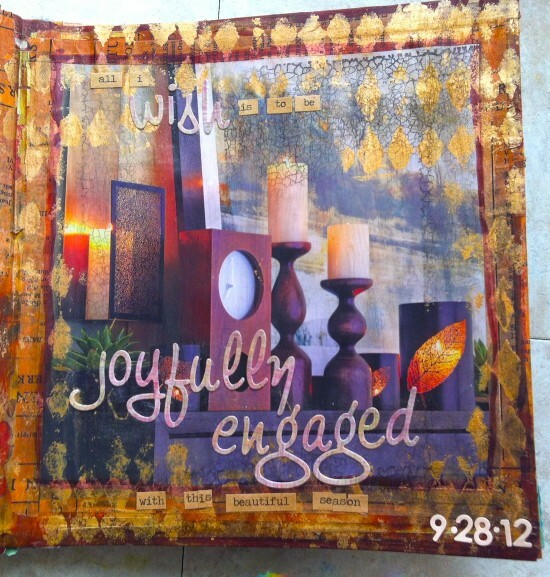 LOVE the banners and color scheme of the first one-party time!Your “joyfully engaged” spread is gorgeous!!! What a lovely tribe you belong to. 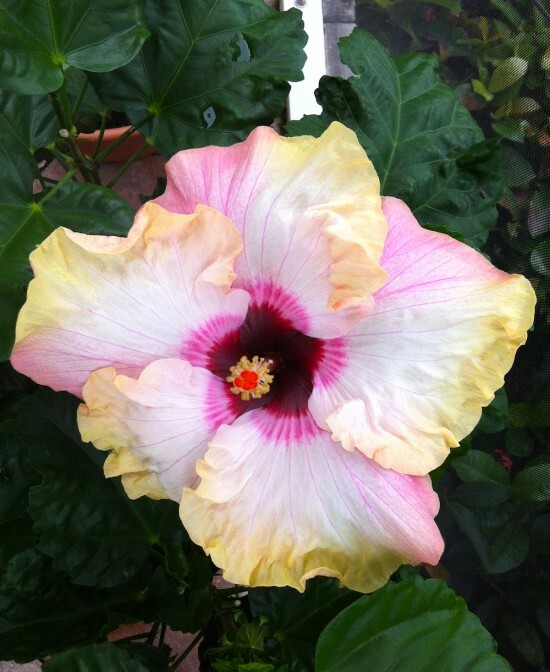 Our hibiscus season is over alas so thank you for sharing yours. I really enjoyed your journal pages…very creative…and diverse…I love the one where you said there were about 50 layers. I haven’t been that brave yet to just keep going….I hope to unleash that soon. 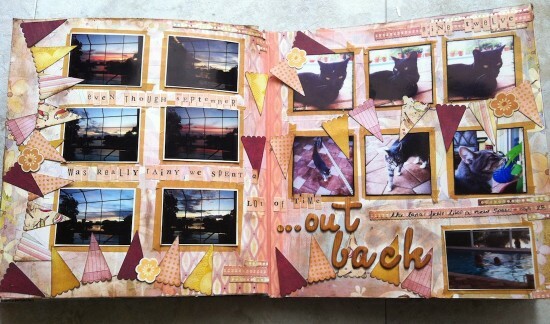 I always enjoy your journal pages, and your sunset postings on FB too. Such lovely color. Your pages are warm and inviting I like your style. 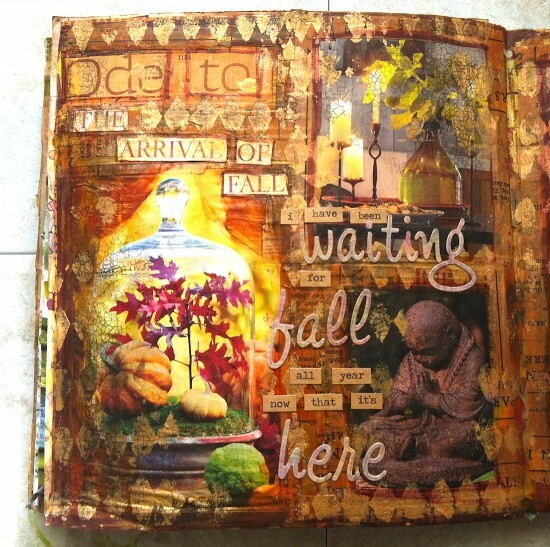 Wow..your art journal pages are stunning and so vibrant.You are so expressive and your work is really beautiful.I have visited your blog and I love it. I would love if you could drop by!